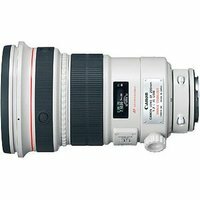 The Canon EF 200mm f2 L IS USM is a professional level medium telephoto lens with Image Stabilizer and Ring USM. EF 200mm f2 L IS USM large, circular aperture is ideal for low light photography, and for fine control of depth of field. Fluorite and UD (ultra-low dispersion) elements, and super Spectra coating minimise chromatic aberration, ghosting and flare, and ensure that images are high in contrast and colour true.